Before you start preparing paella, it's best to check you have all ingredients and gather the equipment that you'll need. * The exact quantity of rice will depend on the size of the pan, so have at least 1 lb of rice on hand. You'll need one whole chicken, cut into serving-size pieces or 8 chicken drumsticks. 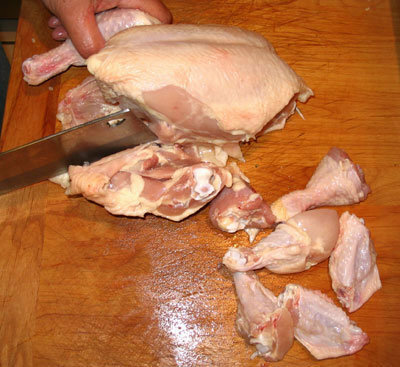 If you use a whole chicken, use a meat cleaver to cut the chicken into pieces small enough to easily mix while sauteing. 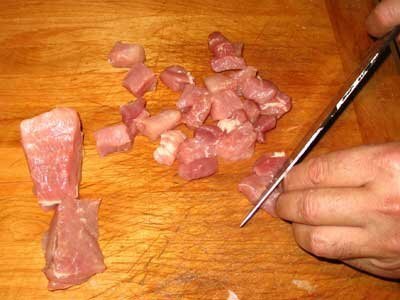 With a sharp knife, cut the pork into 3/4" pieces. Clean the squid and remove the tentacles. Make sure to remove the innards and the "spine" and discard. Then, cut the squid into rings. Tip: Try to buy fresh squid whenever possible. If it is not available in your area, look for packages of squid already cut into "rings." It will probably be in the frozen food section of your supermarket. The squid should NOT have batter or coating on them, since that type is used for frying. Slice red pepper and chop onions and tomatoes, set aside. Now that you have the ingredients cleaned and chopped, it's time to start the BBQ and begin cooking. When the coals on the BBQ are covered in white ash, cooking can begin. Assemble all the ingredients on a table near the BBQ, so that you can stay in the area and monitor the cooking. 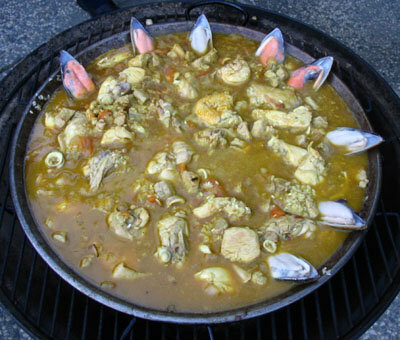 Place the paella pan on the grate and add enough olive oil to coat the bottom and allow the pan to heat up. When hot enough, saute the onions and tomatoes in the olive oil. Add olive oil as needed to prevent sticking. 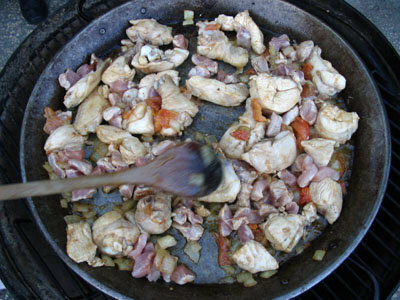 Once the onions are translucent, add the chicken and cook, stirring constantly – about 15 minutes. Add pork and squid and cook, stirring often. 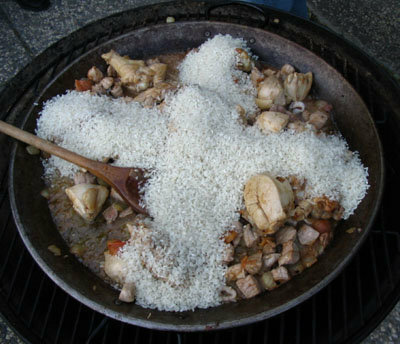 Add the rice in the form of a cross, as shown in the photograph. (You should have at least 1 lb of rice on hand, depending on the size of the paella pan.) Stir for 2-3 minutes to thoroughly coat the rice with oil and mix with the other ingredients. Add saffron to the chicken broth and stir. Slowly pour broth into pan until pan contents are covered. Spread ingredients evenly over bottom of pan. Arrange mussels around outside edge of pan. Place clams and shrimp distributing them around pan. 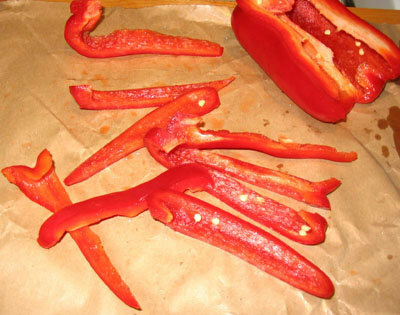 Add slices of pepper on top. Allow to simmer, cooking rice. Add more broth if necessary. When rice is almost cooked, sprinkle peas over the pan. 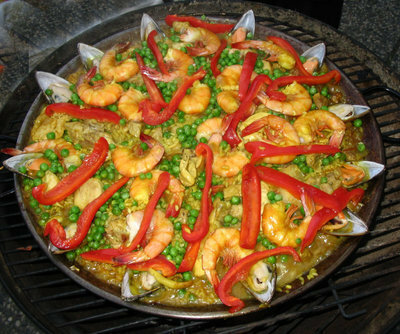 When rice is cooked, remove from heat and cover with aluminum foil, allowing paella to “rest” for 5 to 10 minutes before serving. Before serving, step back and admire the beautiful dish in front of you! Serve paella with Lemon Wedges - Enjoy!